The Descendants of Thomas Stanger, circa 1610. 2. William Thomas STANGER  (Thomas1) was born in 1638 in Harringworth Northamptonshire England, died in 1716 in North Luffenham Rutland England at age 78, and was buried on 20 Feb 1716 in Harringworth Northamptonshire England. Imprimis. I give and bequeave unto Isbell my loving wife all my part and share of my goods cattell, chattell credits and ready mony which I am at this present time in the veal and full possession of for her my said wife to go on in all things eaquel with my son Mathew Stanger both in stock and husbandry, debts and proffits as we do now, the self same half for Isabell my wife peacable to enjoy during her natural life; and when it please god my wife dies the same half shall be my son Matthew Stangers and his heirs for ever (excepting the household goods and moveables) but….if my son Matthew Stanger hath no heirs lawfully begotten by him to survive then all my part and half of goods cattell chattell and substance (excepting my household goods) my said wife shall equaly part, give and divide among my own children then living, or as shee shall at her discretion think fit or as they shall wan and have need. Itam I give unto my son Matthew Stanger all that other even and eaquell half of my goods and stock of cattell and whatsoever he deams as his half ( excepting my household goods aforesaid) which he is in the present possession of and satisfied to him by a certain deed of gift the same half to be to the said Matthew Stanger and his heirs forever. Itam I give unto my son William Stanger the sum of one shilling. Itam I give unto my daughter Elizabeth Stanger the sum of thirty pounds together with all my household goods of what nature or soever the same to be at her own disposing after the death of Isabell my wife and also my will is that my said daughter Elizabeth Stanger shall have free and peaceable ingress and degress incoming and outgoing so long as shee shall think fit to live in the said house with her said mother and for wont of such peace and qualtness which oft to be in familys is the cause of such dis…… be thorough my son Matthew Stanger or any of his …..my will for ….. is that Matthew Stanger his heirs or assigns shall pay my said daughter Elizabeth Stanger the sum of twenty pounds out of his own substance the same to be….. covered by such means as my said daughter or acrifers think most fit and convenient to be taken in such cases. Itam I give unto my daughter Sarah Woodcock the sum of ten pounds. 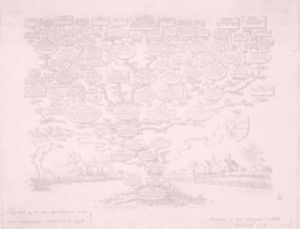 In an eMail, dated April the 11th, 2008, Mark Ward sent a Stanger Family Tree. The following comes from that Tree. Our earliest known ancestor began his working life as a carpenter andlater farmed on the Northamptonshire bank of the river Welland at Harringworth. He was also a Baptist Minister and suffered under the Conventicle Act for preaching. His goods were ordered to be confiscated, and several times a warrant was issued to seize his cattle, "but previously to its being put into execution, being appraised by some goodNeighbours of what intended...they drove his cattle over the river into Rutland and thereby repeatedly frustrated the purpose of his persecutors". In the reign of either Charles 11 or James 11 he was imprisoned for some time in Northampton Jail. He is mentioned in Crosby's 'History of the English Baptists' which says "Mr. Joseph Slater, Mr. William Stanger and Mr. Robert Bringhurst, to escape imprisonment, wereobliged to fly out of the county. But they had their goods and cattle seized often and redeemed by some of their Neighbours so that they were thereby put to great charges and in the end taken by process and made to pay Goal(sic) fees to obtain their liberty. William appears to have been survived by four sons, William, John, James and Matthew. William married Isobel  [MRIN: 2433], daughter of Unknown and Unknown,. Isobel died in 1720 in Harringworth Northamptonshire England and was buried on 27 Jan 1720 in Harringworth Northamptonshire England. + 3 M i. James STANGER  was born in 1667 in Harringworth Northamptonshire England and died in 1747 in South Africa at age 80. 4 F ii. Elizabeth STANGER  . + 5 M iii. Rev. William Thomas STANGER  was born on 18 Mar 1668 in Moulton Northamptonshire England and died on 8 Feb 1740 in Moulton Northamptonshire England at age 71. 6 F iv. Mary STANGER  . Mary married COLLEN  [MRIN: 18792]. 7 M v. John STANGER  . John married STAUGHTON  [MRIN: 2436], daughter of John STAUGHTON  and Unknown,. + 8 M vi. Matthew STANGER  was born about 1675 and died in 1762 in North Luffenham Rutland England aged about 87. 9 F vii. Sarah STANGER  . Sarah married WOODCOCK  [MRIN: 18791].